Win £5,000 This Summer With Mr Green Cash Drop. If the torrential rain and uncertain economical climate have given you the blues this summer, why not cheer yourself up this summer with a first prize of £5,000 in the Mr Green Cash Drop promotion? From now until July 7, players at Mr Green Casino will be given the opportunity to channel their inner Indiana Jones and go hunting for a forgotten fortune by playing the Richard Wilde and the Book of Dead slot. For every series of 20 spins they take at a minimum value of 10p per game, players will receive one entry into the £20,000 Cash Drop prize draw, where one winner will take home £5,000. With names drawn out of a virtual hat after the promotion closes at 11pm next Thursday, 50 lucky players will all receive a share of the prize fund, with at least £50 going to each winner. In addition to the £5,000 top prize, the first five names selected will also receive a four-figure windfall, while “smaller” prizes of £500, £250 and £100 will be shared among the other randomly-chosen winners. The draw itself will take place on Friday 8 July, with all prizes being credited to winning players’ accounts the same day. This gives you a great incentive for playing what is normally an extremely volatile slot for the remainder of this week and the next on Mr Green Casino, with the potential of huge cash prizes easily making up for the barren runs that can be expected from the Play ’n GO Title. For those unfamiliar with Richard Wilde and the Book of Dead, the game is an Egyptian-themed, five-reel, 10-payline slot featuring all manner of hieroglyphics and desert-themed iconography among its unique symbols. Boasting a free spins feature with expanding icons, the slot’s strongest suit comes in the form of its bonus payouts, which can deliver a welcome river of riches to players. When free spins are activated, one randomly chosen symbol will gain magical properties and expand to fill the entire reel after each spin. With a bit of luck, this will complete multiple paylines and award some lucrative wins, helping players overcome the long losing streaks they can expect during the base game; with a top award of 500x your bet per line on offer for matching five jackpot icons. If you like the sound of Richard Wilde and the Book of Dead or simply fancy putting yourself in the frame to win a share of the Mr Green Cash Drop prizepool over the next few days, why not sign up to the site and give it a spin today? 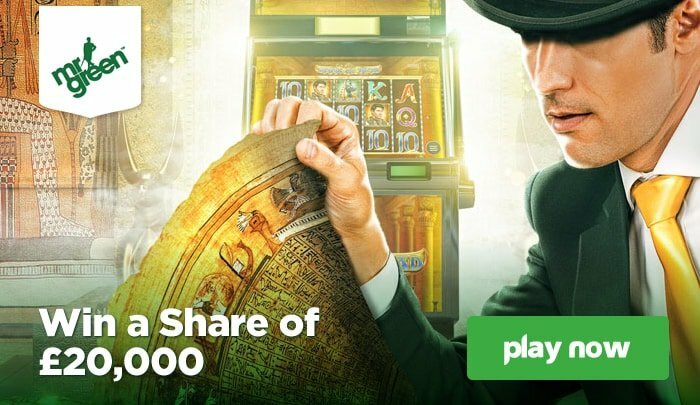 New players at Mr Green Casino can benefit from a 100% first deposit match up to £100 and 100 free spins on the exclusive Mr Green Moonlight slot.